These items are off-the-shelf type products that have no customised components. These types of item are made to order to suit an individual. Lead time may be increased due to custom ordering and configuration. The Molift QuickRaiser 205 introduces the latest in technology for sit-to-stand hoists. 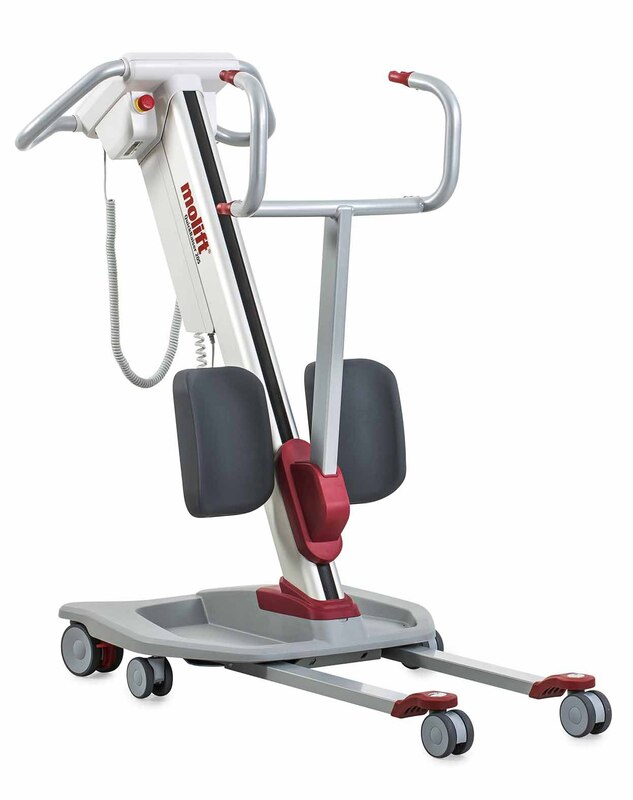 The leg base is electrically adjustable and with an outstanding lifting capacity of 205 kgs. Along with its exceptional manoeuvrability, the standing hoist is also comfortable and stable. The unique wheel position, angled push bar and the extraordinary weight distribution of the base provides a small turning radius and easy movability even in very narrow spaces. The electrically adjustable legs enables accessibility almost everywhere and the small castor option allows the legs to fit under most beds and chairs while. The inclined column encourages a natural pattern of movement and fulfills the hoisting needs of users with some weight bearing capacity. The Active Lifting Arm (four point spreader bar) and the RgoSling Active provides extra support when hoisting from sit to stand to enable comfort, stability and safety. Warranty on the QuickRaiser 205 and all Molift lifters is 2 years. Molift hand controls and batteries have a warranty of 6 months. Ergonomic design The slanting column lifts the user up and forwards to imitate the natural movement pattern.